I am going to get a little real here, so bear with me. I believe that by sharing our challenges we are doing our part to grow own our truth as well as show our peers, who could be or have been through similar challenges, we are not alone. I am on high side of a rough few weeks. I don’t know about you, but when the bank account is weak, I tend to say “yes” more than I should. So combined with attempting to right the “financial ship” and still keeping my responsibilities in check I take on more work than I technically should. Have you heard and experienced the creatives’ cycle? Sally Hogshead explained it best with her take on “Creativity and the Throne of Agony” Her take is about the creative process, but I think it relates to the solo business model as well. Yup, I had mine. Sitting all alone in my office, feeling like the weight of the world perched upon my heart, breathing is hard, seeing any kind of light isn’t even an option. It was at this point I had a scheduled Designers Roundtable session where I was expected to share how I have made my list of goals and accomplishments. I was SO close to bowing out. Why show up to my peers with nothing to show for the past month? But there was something that wouldn’t let me. So I showed, feeling sheepish and not wanting to really share my failures because tears of shame and frustration were sure to follow. I held off until the last 10 minutes to share my part and found myself rambling about what I thought were simply excuses. I have high expectations for Creatives’ Cupboard and myLife Planners, and I put added pressure on myself by being critical about not just doing the work. In fact, it is that assumption that is the hardest to overcome. It drags me down and puts so much pressure on me that I bend to it and appear to fail, in my own mind. Not surprising, the feedback from the group was warm and encouraging. I think the most significant moment was that the last person to share also held off as well because she was in a similar state that I was in. Seeing that I wasn’t the only one going through a challenging time and had the same feelings/reactions to not achieving our goals is what started to turn the tables for me. Because I faced my fear and chose to be honest, a few of my peers stepped up and offered to spend time with me later in one-on-one calls to talk things through. This was especially helpful, being able to be a little more honest isn’t always the best “group” setting. But it was from this group that I found the support I needed. I realized I couldn’t get out of the abyss of self doubt alone. When I reflect back, I am not surprised by these dips in my creative business experience. 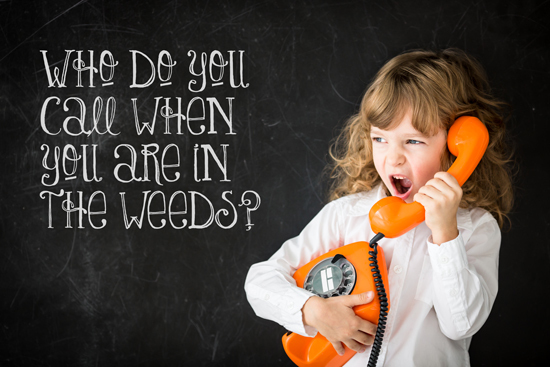 The fact is we can’t avoid the “weeds”, we will inevitably run into them and need to just make our way through. Now here is the important part – I realized I couldn’t get out of the abyss of self doubt alone. I accepted the advice and support of some beautiful people, but I also asked for help from people who I knew I needed it from. Success, okay maybe more like survival, in our industry requires peers who provide support with honesty, insight and positivity to help to make the “solopreneur” path not feel so solitary. …acceptance of my imperfections and knowing that success is never achieved alone feeds my soul. I am on my way, hiking out of the valley of fear and doubt, with so much thanks to those who support me. But also in a very big way, my acceptance of my imperfections and knowing that success is never achieved alone feeds my soul. Who do you have in your corner? I think the hardest part of creating your own community of peers is finding a group who you trust enough to be honest with. Without transparency you can’t see the big picture and you will never get the real insight and feedback you need. If you aren’t already part of a similar group, I encourage you to start looking around. If the DR seems interesting, I will be volunteering as one of the group facilitator’s in the upcoming Jan-Jun 2016 term. I would be happy to let you know what would be in store and sometimes having a connection with someone in a group of strangers is a warm way to get started. Drop me a line!